This tutorial is one of those fun techniques discovered while trying not to panic about my “resin window” closing and the mixture becoming too thick to use. 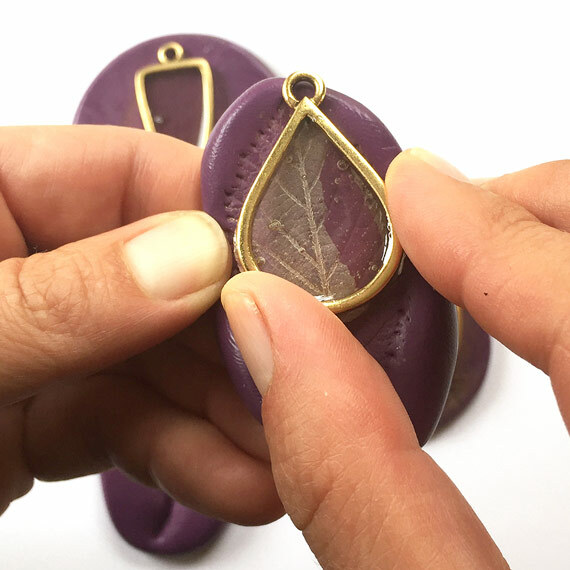 It involves making and creating your own mold using organics, such as leaves, and pouring the resin into open back bezels that are placed onto the mold’s surface texture. 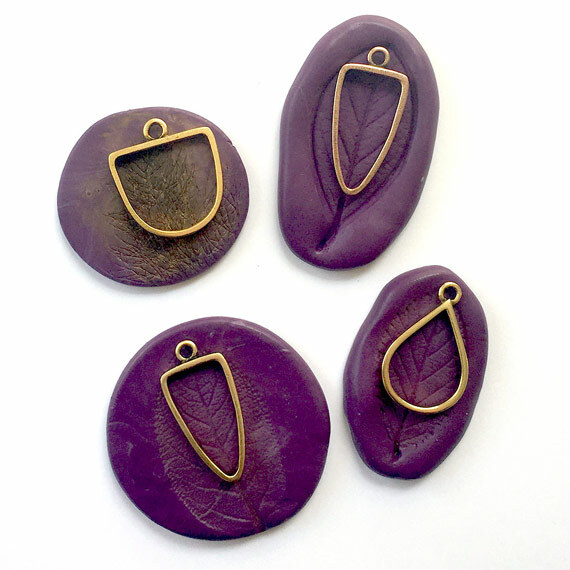 3 Open Back Bezels are included in the Buy & Try Making Molds with Organics to Create Sculpted Resin. Bezels are cast lead-free pewter and plated copper, 24k gold and .999 fine silver. All of the other supplies needed for this technique are also available in this Buy & Try. Made in the USA. Watch Quick 1 Minute Tutorial Video! The first step is going to be making a silicone mold with Easy Mold Silicone Putty. 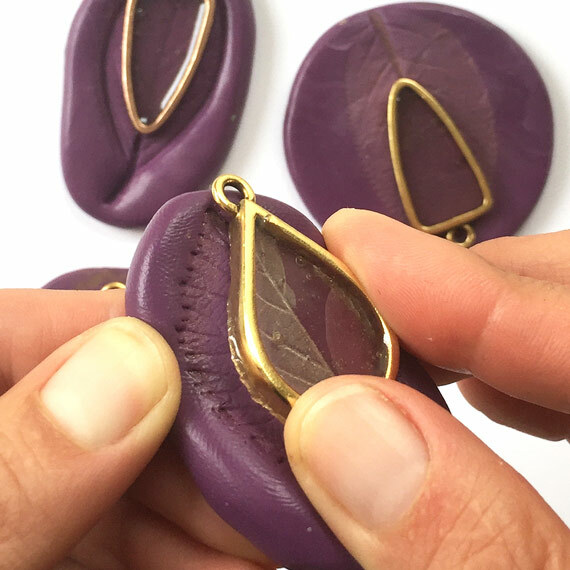 Read the full step-by-step tutorial in our previous blog post here: How to Make a Mold with Organics Tutorial. Make sure that after you have removed the organics from the silicone putty, that you allow for the mold to set for 24 hours. The silicone putty will continue to off-gas within this period. 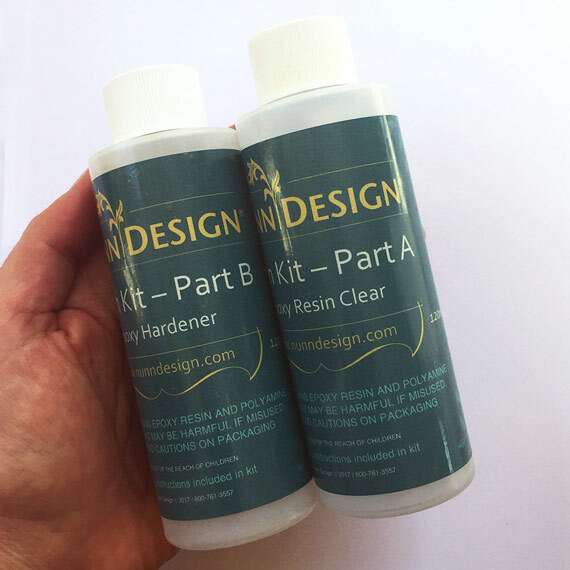 If you do use Nunn Design Resin right away within the mold prior to allowing the mold to set, air bubbles will release into the resin. The Nunn Design Findings are oxidized to provide the antique look to the precious metal plating. The oxidization, when it comes into contact with the resin, could change the color of the resin. To avoid this, clean the bezels thoroughly prior to application of the resin. Dip the tip of a Q-Tip into rubbing alcohol and clean away any of the blackened oxidization from the surface. Shoot, I just clean the whole thing for kicks. 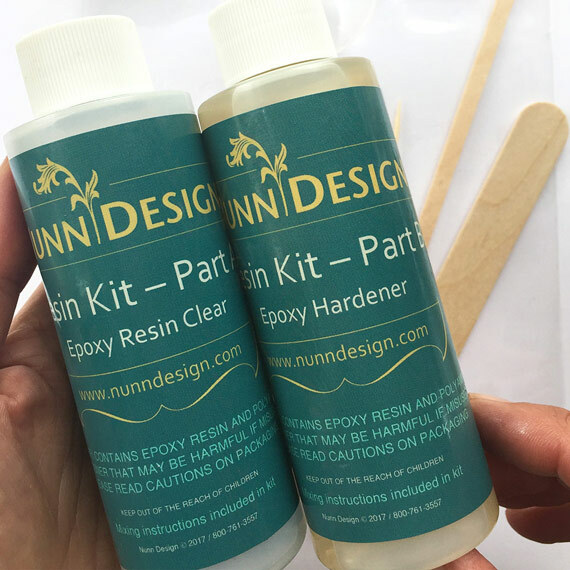 You can also watch this great video on How to Mix Nunn Design Resin! Place one cup (included in the Nunn Design Resin Kit) onto your table. Pour Part A of your resin kit up to the ½ fluid ounce mark on your measuring cup. 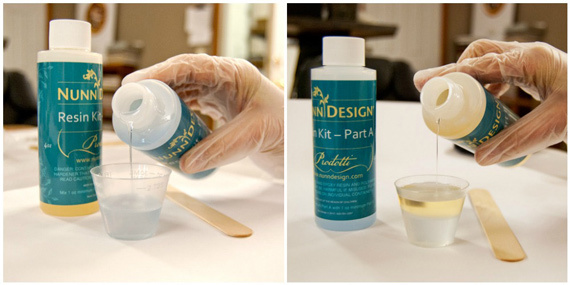 Pour Part B of your resin kit into the same cup until it is filled to the 1 fluid ounce mark. It is important to pour Part A first and then Part B. It is some chemical thing about the part A being heavier or something. In order for the resin to not seep out from under the edge of the Open Frame Bezels, the resin needs to be really thick before applying it bezels. Lay the cleaned bezels onto the silicone molds. 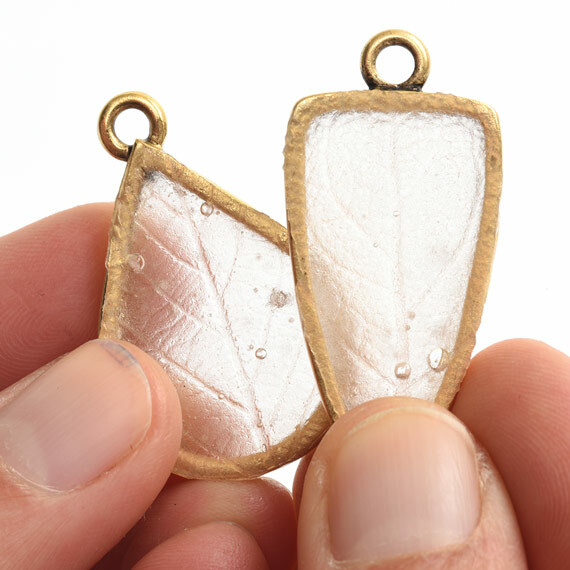 Scoop the thick resin into the bezels and use a toothpick to move the resin around. Agitate the resin along the edge of the Open Frame Bezels, causing air that might be trapped in those areas to dislodge and rise to the surface of the resin. 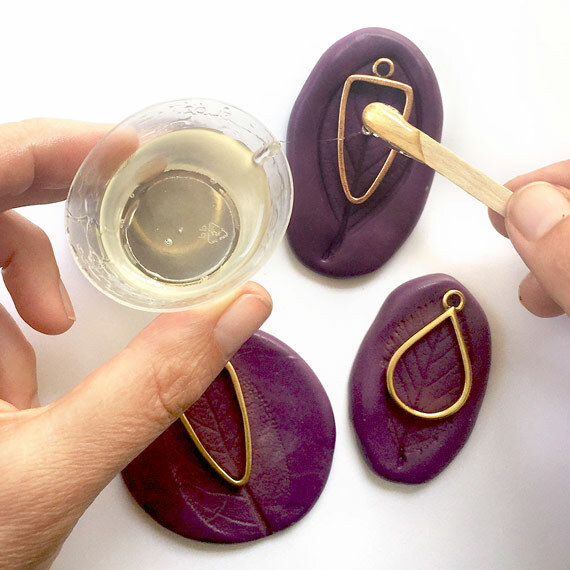 To make sure the resin cures level once poured into the bezels, you may need to prop up your silicone putty underneath the mold with toothpicks, coins or cards. Babysit the curing resin for the first 1-2 hours. If you see bubbles rising to the surface, using your hot breath, breathe on them. It isn’t a “blow” sort of breath – more of a “huff” sort of a breath. The hot air will make the bubbles expand, rise to the surface and pop. As the resin starts to set-up and become thicker, it will be more difficult for the air to rise to the surface. 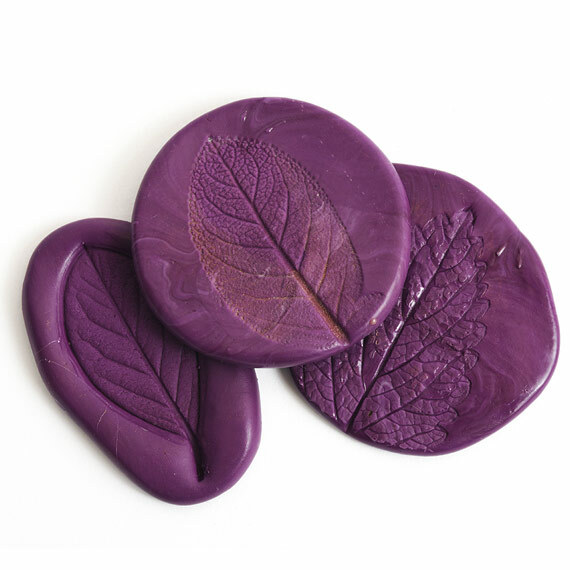 Let the resin cure on the silicone molds for 6 hours or until the resin is firm to the touch. If the resin is too soft and slightly tacky, wait an hour and try again. This stage of the curing resin’s process is referred to as the “soft cure” stage. Once the resin is firm to the touch, bend back the molding putty at one of the edges of the Open Frame Hoop, peeling it away from the resin. 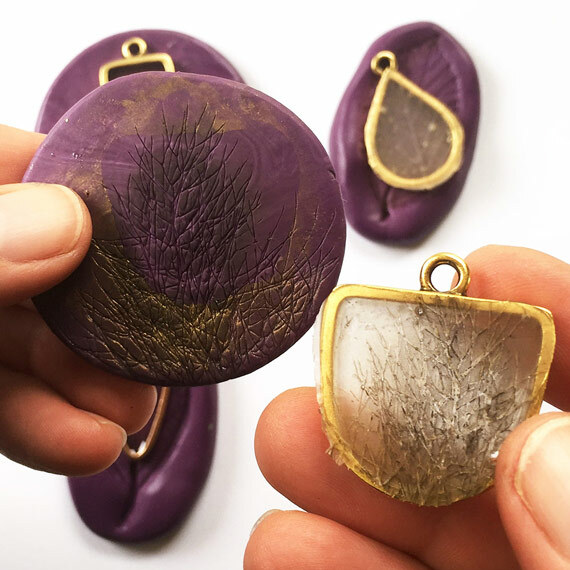 You will know the resin is ready to release and peel away from the silicone mold when you start to see the resin turn lighter in color. It is doing this because it is releasing from the silicone mold. For this pendant, I used a Q-Tip to smear a bit of PearlEx Powder onto the mold prior to pouring in the mixed resin. It provided an interesting design in the resin. 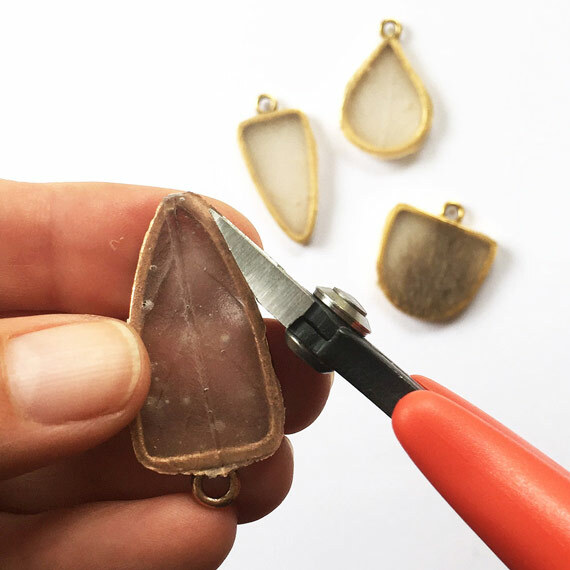 If you did have any resin seep out from under the open back bezel, use a pair of scissors or flush cutters to cut away the excess resin. Make sure to wipe down your scissors after cutting to remove any resin bits. If your resin has sharp edges, use a #0000 super fine steel wool to lightly sand the areas. Watch the full class video where I walk you through the whole process! With each of our Buy & Try Tutorials, all of the supplies you will need are available for purchase. The Special Offer period of this Buy & Try has passed; however, you may still purchase the supplies for this technique!